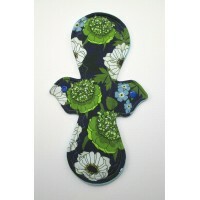 Pretty Period regular flow pads are designed to be worn as day pads for a regular flow period. Each pad has a jersey topper, a core layer of zorb followed by a polar fleece backing. These pads are designed to be worn pattern up. 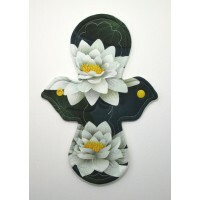 Each pad is approximately 10 inches (25.5cms) long and 2.5 inches (6.5cms) wide when snapped. The pads can either be soaked in cold water immediately after use or placed in a wet bag (all sizes are available on the website.) If the pad hasn't been soaked in water I recommend putting on a rinse cycle before washing. They can then be washed on a normal wash up to 40C without fabric conditioner as this affects absorbency. They can then be hung to dry or placed on a very low heat setting in a tumble dryer.